According to the indenture dated 25th January 1870 James Cole Copeman conveyed to The Loddon Town Hall Company (Limited), for the sum for £30, the site on which to build the Town Hall. We feel the actually buidling of the Town Hall must have been started before the conveyance was drawn up because the Petty Sessions were held in the Town Hall for the first time on Wednesday 10th August 1870. The red brick building was very ornate, as was the style of many Victorian architects. The oldest photograph we have shows much fancy brickwork and ornamentation . A great deal of this has succembed to time and either fallen or been removed for safety. However, the fine "Elizabethan style" windows are virtually intact. The magistrates' court was held fortnightly in the main room, the witness box etc were stored there and brought out for the occasion. The hall was lit by gas, one of our oldest local residents, Charlie Spurgeon, remembers "gas jets coming out high up on the walls, not with a mantle or anything, which were lit from a long pole with burning meths at the top". The heating was by at least two open coal fires which the caretaker, Mrs Ted Goate would light. During the 1939/45 war the Town Hall served several vital functions, many of which have been written about in the two Wartime booklets in this series. (See Aspects of War and More Aspects of War). The Parish Council called a meeting in the Town Hall when volunteers for Air Raid Precaution duties were needed. We know the southern front room was the main Civil Defence Report Centre, in direct communication with the Observation Post on Beccles Road. This could well have been gas proofed as well as shored up, in case of a direct hit. The brick 'stable block' which bounded the southern side of the main hall, we believe, was used for salvage storage and was damaged by flames when the sun shining through the 'bottle bottom' glass window set fire to the stored paper. 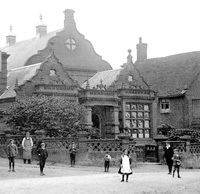 The First Aid post was at the Town Hall; the evacuee children from London were first assembled in the main hall before being allocated to families in the village. However, most people remember the Town Hall for the dances held there both during the war and after. Cecil Nichols says "Mostly the dances were with Tots Howes and her record player, but sometimes there was a band... It was 2/6d to go in and when I was just old enough to drink me and my friends would pay for the girls to go into the dance, pop into the Swan for a dink and join the girls later." Over the year cost of maintaining such an ornate building have posed problems and the owenership of the Town Hall has changed hands several times. It is to this end that the Loddon Buildings Preservation Trust was set up. The Loddon website (www.loddon.org.uk) has more details. The Loddon Buildings Preservation Trust was duly set up as a charitable company, limited by guarantee, with membership invited from the general public. The membership is on two levels - annual or life. Membership - You can help to preserve these buildings by becoming a Member of the Trust. Full Members - for a one-off payment of £25 you can secure membership for life, as well as being entitled to vote at General Meetings of the Trust. Associate Members - the fee payable is £5 per annum. However, an Associate Member is not able to vote at General Meetings.